Time for a catch up ………….. I just don’t know where all the time goes. Lots of happenings around here over the past few months (except for blogging!!!). 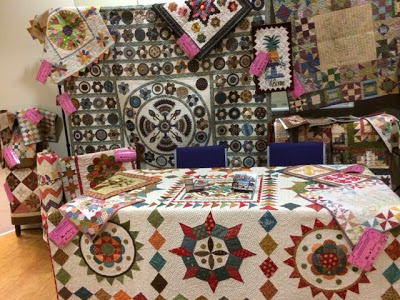 Between classes and preparing for the Australian Quilt Market (Trade event) and all the other goings on in life blogging has taken a back seat. So now I have a few pictures to update you with. This could be a long post. 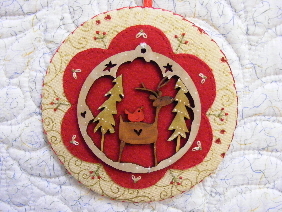 In October & November some lovely ladies joined me for a couple of stitching days working on some Christmas Decorations. 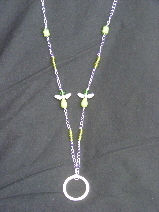 This is a picture of 2 of the main items that were worked on. A lovely time was had by all. 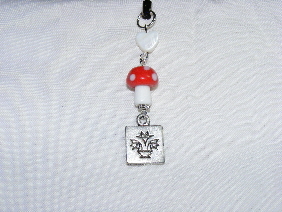 The buttons used were by Barb Smith and can be purchased from http://www.theodoracleave.com. Her buttons are exquisite and it’s hard to decide on which ones to purchase. Then it was full steam ahead working on some new patterns. Firstly there is the Wynter Sewing Set which is a pincushion and a sewing pocket to keep your needles & pins, threads & scissors in. 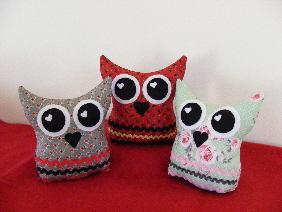 PJ the Owl is a pyjama pillow to pop your little ones pj’s in or it can also be used as a hot water bottle cover. You could even pop a wheat bag inside if you wanted to. I would also like to introduce “Pipkin”. 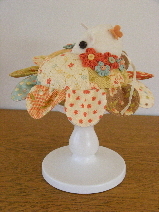 This pattern is called Pipkin’s Pincushion and is attached to a candle block holder (available from IKEA). 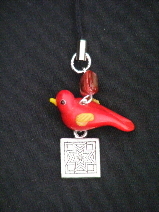 This pattern is made using just 21 x 5 inch charm squares!!! Stay tuned for some more additions relating to Pipkin over the next few months. 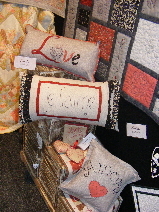 My final 2 newies are Heartstrings (quilt) & Love Trio (3 cushion set). 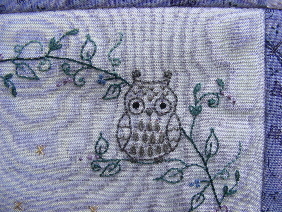 I really enjoyed working on this project as it was something that I had wanted to do for a while and is a little different from my normal style but incorporates the stitchery designs I love. 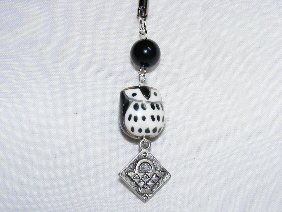 Something I haven’t blogged about this year has been my daughter’s little project “LK Designs” where she has been making Scissor Charms this year and has now added some glasses holders to her range. They have been extremely popular this year and were a huge success at the AQM. 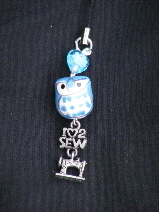 As supplies change all the time sometimes beads become unavailable so each scissor charm can be diferent from the next. Here are a few to show you. 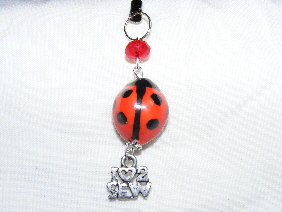 The owls and ladybugs have been very popular and come in a variety of colours. 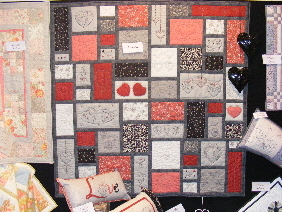 All of these new patterns were introduced at the Australian Quilt Market almost 2 weeks ago. This is a picture of my stand. It was lovely to meet up with some familiar faces and to make some new acquaintances too. I look forward to talking to you throughout the coming year. Check your local quilt stores if you would like to purchase any of these patterns. They will be available on my website for viewing soon. Back soon with some spring pictures of my garden. 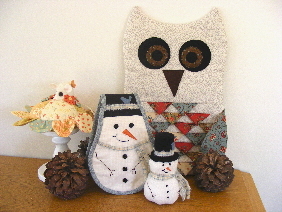 Back with a new post about my latest released pattern called “Woodland Friends”. 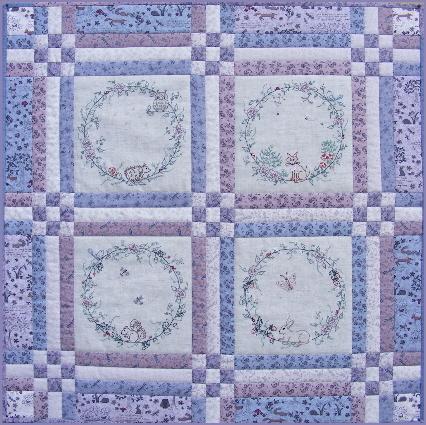 It is a small wall quilt approximately 29 inches square. 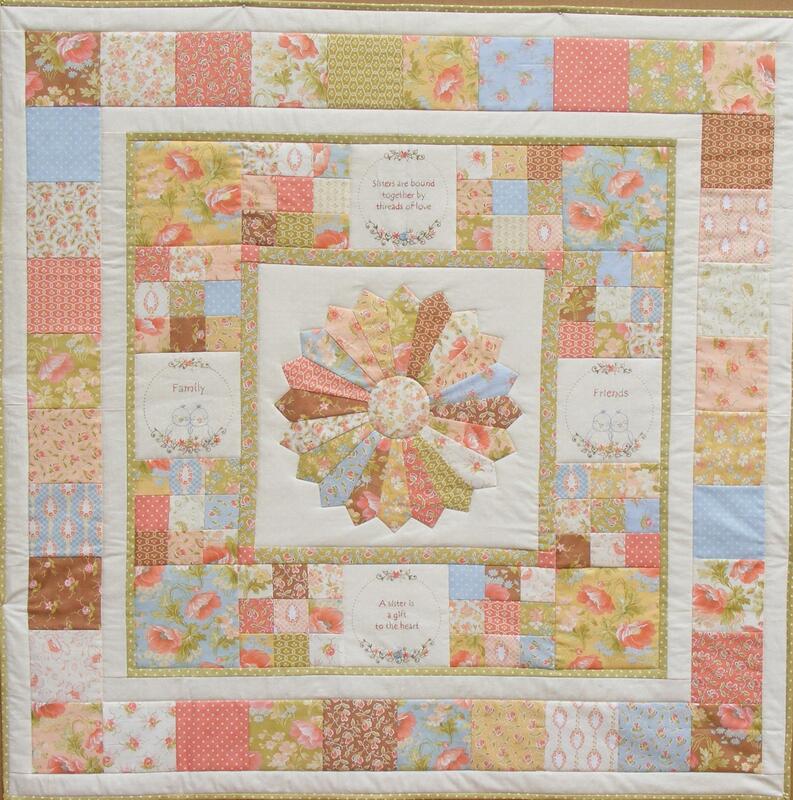 It is made with Lynette Anderson’s fabric called Wildflower Wood which is just gorgeous. 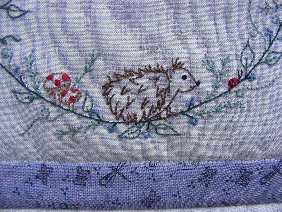 It features some cute little animals :- hedgehog, owl, fox, squirrel, & rabbit plus some cute little bugs. There will be a coordinating project in Creating Country Threads which will be released this month. I will have the pattern available on my website very soon and another small project that also goes with them which is still to be completed. I will pop back when the project is released in the magazine to show you. 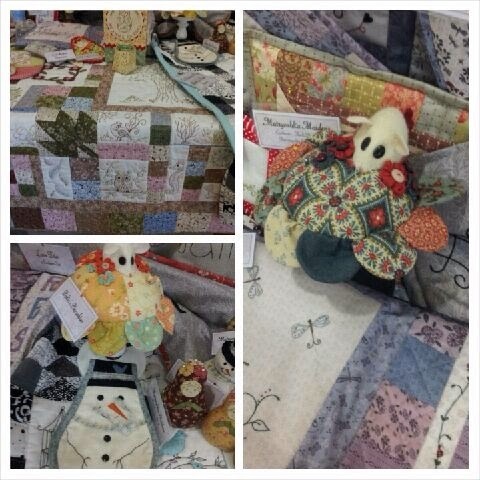 If you like the fabric visit the Little Quilt Store where some fabric bundles are available in the range. 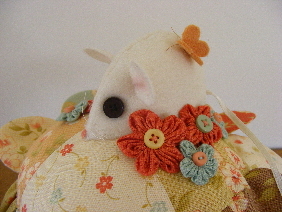 Hope you get time for some stitching while the weather is still quite cold here! 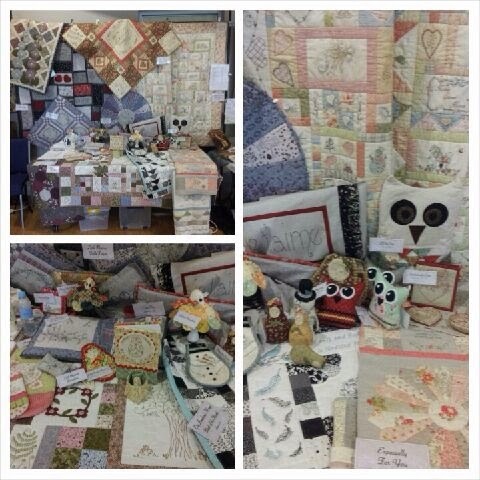 A lovely day was had by everyone on Saturday at The Quilter’s Patch. The weather was perfect and our small group of ladies had a nice time stitching, nibbling, stitching, eating, more stitching and nibbling and then before we knew it the day was over. A big thank you to Laurene & Angela for organising the day & yummy treats. 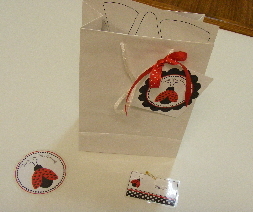 Everyone received a goody bag with their kits included and this is the project that was worked on. The ladies were delightful and I had a great time with them. Looking forward to planning another day later in the year. This year has been busy and is rushing by too fast. This post will be rather long so it may pay to make a cuppa before proceeding. Earlier in the year I made a quilt for my sister’s birthday. 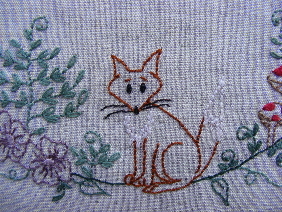 I decided to also make it available as a pattern, so stitched another one in a different colourway. This first picture is of my sister’s quilt. 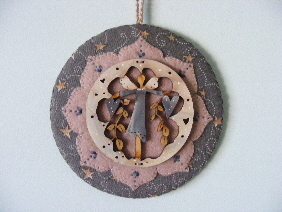 So I then decided to make it using a linen background and in pinks & greys. 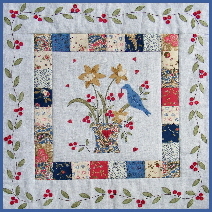 In the pattern I also included wording in the quotes for not only sister but mother, daughter, friend and families. 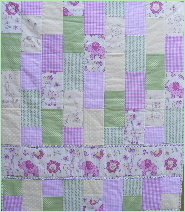 So thanks to a friend, my sister quilt became entitled “Especially for You”. 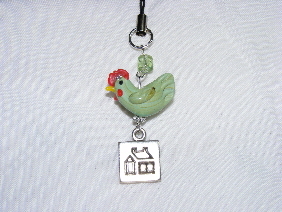 It would make a great gift for Mothers Day or for a sister or friend. My next project was a present for my friend for her birthday, so using the same fabrics as I did for my sister I set about making this table runner, which she loved. Once again I remade it with a slightly narrower border and in contemporary colours, which is now available as a pattern called “A Trio of Daisies”. 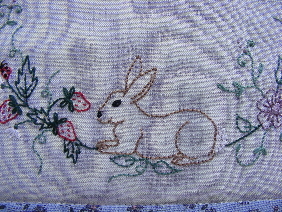 There is a small stitchery with a butterfly in the centre of the large dresden plate. I am totally hooked on Dresden plates – just love them. I also have just released a new quick & easy baby pattern called “Happy Tails”. 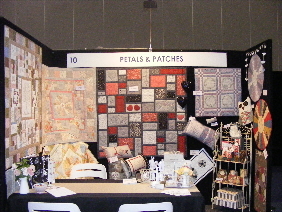 All of these quilts are currently on display on the Blue Willow Cottage stand at the Australian Quilt Convention that is currently on (18th – 21st April 2013) at the Royal Exhibition Buildings in Carlton. If you are in Melbourne this weekend the show is well worth a visit. Pop by and say “Hi” as I will be working on the stand for the duration of the show and would love to see you. 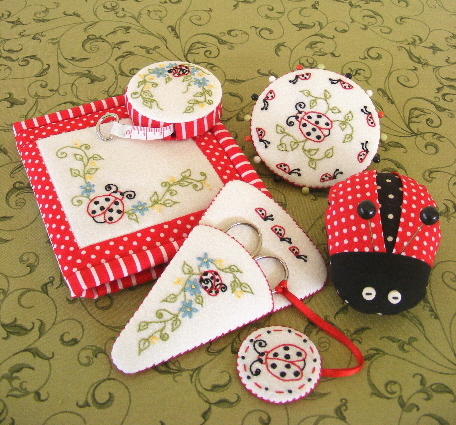 These patterns will be available soon on my website. 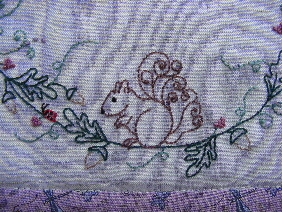 So as you can see by this extremely long post I have been rather busy with needle and thread in hand. Other projects have also been in the works so will pop back later on and maybe give you a sneaky peek at what I’ve been up to. It has been rather busy in this neck of the woods so I have a few pictures to share. I should have posted a picture of this quilt a little while ago. 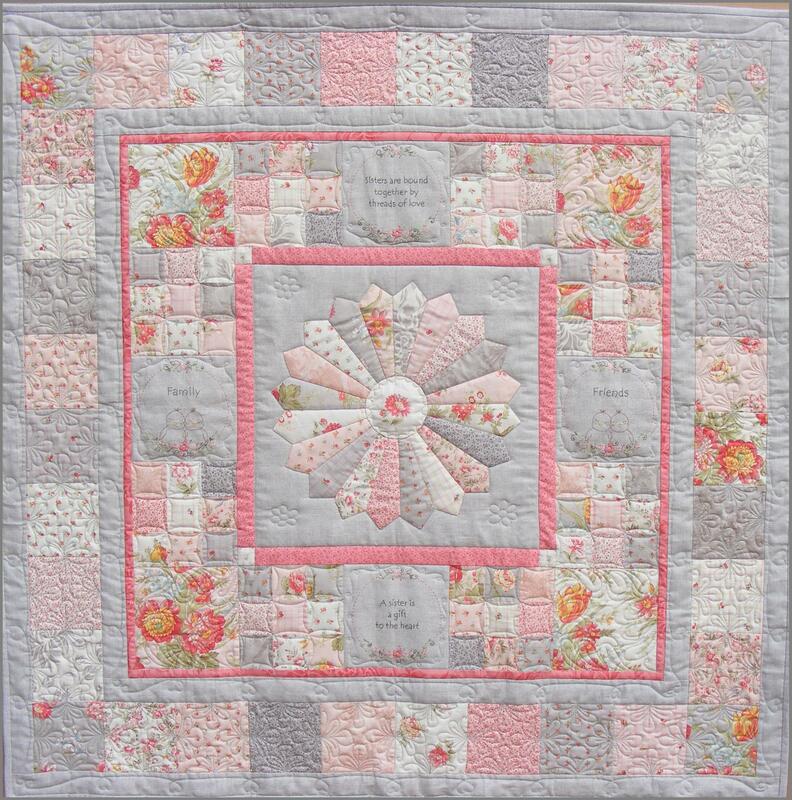 It is called Lattice Garden and is made using the fabric range “Secret Garden” by Lynette Anderson. 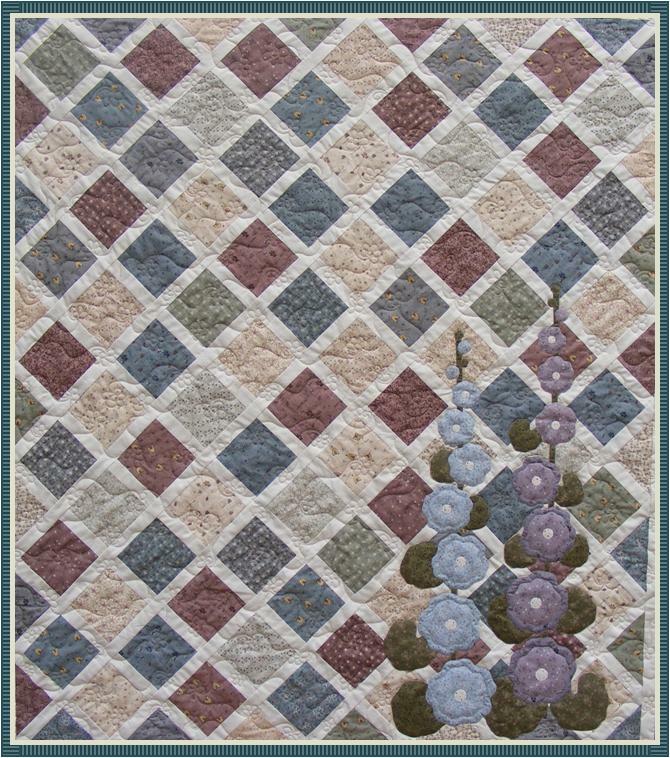 This quilt is quite quick to put together and features some applique hollyhocks which can be done by hand or machine. It would even be great to use up some fabrics from the stash that we often have put away. 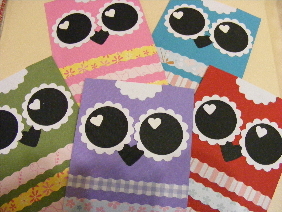 My next post will be about some new patterns that have just been released. Stay tuned.